NATIONAL Homebrew Day came and went in Savannah without much fanfare. It’s unfortunate that more isn’t made of National Homebrew Day, as home brewing is a fun and satisfying hobby. But who needs just one day when there are 364 other days to brew your own beer? Home brewing may seem like an intimidating hobby to get involved with, but have no fear; the process involves some work but is really very straightforward. And in the end you have a bunch of beer to drink. There are plenty of passionate homebrewers in Savannah to provide advice or teach you how to make your first home brew or improve ones you’ve already made. Moon River Brewing Company on Bay Street is the local hub for most home brewing activities. The Savannah Brewers League has used Moon River as its home for many years. Founded in 1993, the Brewers League has passionately fostered the Savannah home brewing community. They meet at 7:30 p.m. on the first Wednesday of every month downstairs at Moon River. They welcome all levels of interest in zymurgy — the study of fermentation processes — and regularly share their home brewing stories as well as their brews. Starting this month Moon River will also be hosting Beer School. These classes are not exactly home brewing classes but will focus on many aspects that will inform your home brewing process and knowledge base. 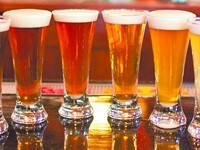 In each class an experienced brewer will cover a beer related topic. One week the brewer might cover the ingredients and science behind brewing, the next barrel aging. Whatever the topic, your home brewing will be better for it and your general knowledge of beer will be improved. These classes will be held downstairs at Moon River the third Wednesday of each month. Each class will cost $35 for advance tickets, $40 at the door or $30 for Moon River “Quality Assurance Club Members.” You can purchase your tickets via email at info@moonriverbrewing.com. The first class focuses on food pairings. If you can complete the class everyone takes a pint glass home. The class starts at 6:30 p.m. with the class expected to last between and hour and an hour and a half. There will be a post class, Q and A and social session in the Beer Cellar Bar until 9 p.m. All ticketholders receive happy hour prices on all drinks in the Cellar Bar. Moon River isn’t your only outlet. Savannah’s sole homebrew store, the Savannah Homebrew Shoppe, is housed in an unassuming sheet metal building on Skidaway Road at 37th Street. 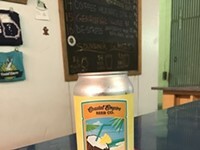 Jerald Jameson, owner of the Savannah Homebrew Shoppe, stocks a wide variety of ingredients and supplies and will readily search out and order anything you need that he may not have on hand. Mr. Jameson is a font of homebrew knowledge, and can recite many beer recipes from memory, and is happy to put together ingredients to brew your own versions. Mr. Jameson and the brewers at the Brewers League are eager to have new brewers so don’t hesitate to mine them for knowledge and advice. Dropping by a local shop or event is probably your best bet for gather some notes on home brewing but there are also plenty of online sources as well. 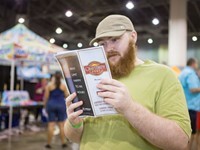 The go-to location is The American Homebrewers Association, homebrewersassociation.org. It is an excellent online resource for the beginning, intermediate or advanced brewer. Their forum lists thousands of recipes with feedback and advice from other brewers. The investment in the equipment to start home brewing can be pretty small. Most retailers sell a basic kit of gear, brew bucket, bottling bucket, tubing and bottle capper as well and a few other necessary gadgets to get you started for around $75. Even that number can be cut if you’re willing and able to take on a do-it-yourself attitude, an attitude many homebrewers already have as it tends to allow plenty of room for experimentation in both the brewing process and your equipment. Most homebrewers start out brewing with extract kits. Extracts are the viscous, concentrated remnants of “mashed” grain. Extract brewing skips the mashing process, allowing you to jump right into boiling up wort, the sweet liquid that is missing only yeast to make it officially beer. Most extract kits make 5 gallons of beer, or about 40-45 bottles, though if you want to move slowly into home brewing there are one-gallon and 3-gallon kits available. Extract brewing yields beer just as good as any other method but many brewers eventually move onto all grain brewing to open up some new brewing options. All grain brewing starts with pure grains. Mashing, slowly heating the grains in water, releases the starches in the grain and converts them to sugars that the yeast will eventually eat as they ferment the beer. All-grain brewing is more work but being able to control each step of the brewing process gives the brewer more opportunities to experiment with beer recipes. If you’ve ever wanted to take up home brewing, then there is no better time to start. The equipment is more readily available and inexpensive than ever. Savannah Craft Beer Week is here!